I find scallops to be a tricky ingredient to deal with. They are delicious but it’s so easy to get it wrong when cooking it. It’s not good to under cook it as it can be dangerous if the scallops are not fresh… and if you over cook it, then it becomes tough. So to enjoy scallops you have to get it just right 🙂 and this recipe for scallops au gratin is a good way to start. 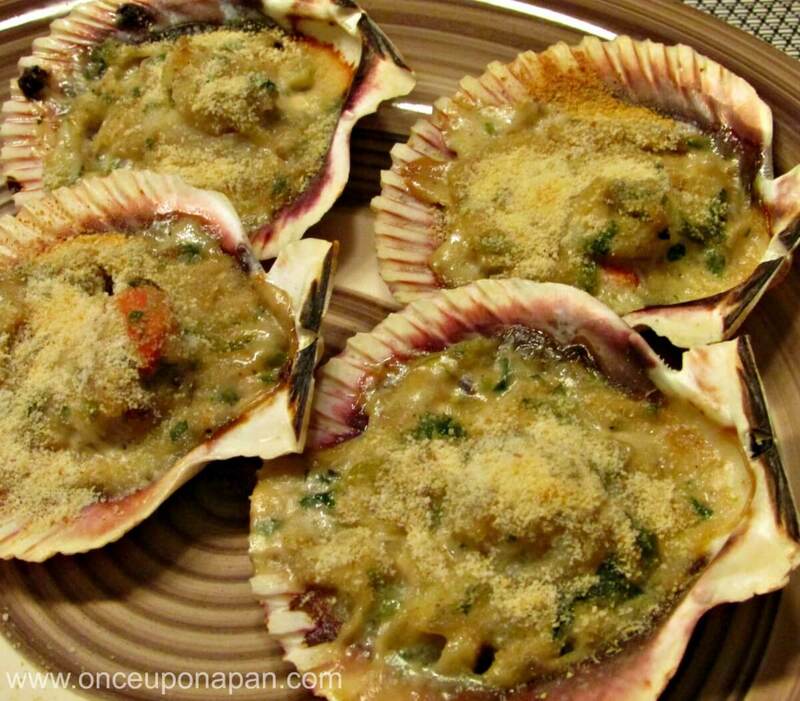 I’ve tried several recipes and I find that scallops au gratin are a nice and safe way of cooking it. It’s quite a quick dish to prepare but you have to stick with the timings otherwise it may not come out as good. Remove the scallops from the shells and reserve both. Clean the shells of any sand residue. In a frying pan, heat a little olive oil and sauté the onion and garlic. Add the parsley and bay leaf. Add the cream and season with salt, pepper and nutmeg. Sprinkle with cognac. Add the scallops and cook over low heat for 2 minutes to thicken the sauce slightly. Place the scallop's shells on an oven tray. Distribute one scallop and about 1 tbsp of sauce per shell and drizzle with the lemon juice. Sprinkle with chopped parsley and grated bread. Place in oven / grill for 10 min or until the surface is nicely browned.